Definition at line 192 of file llviewerpartsource.h. Definition at line 683 of file llviewerpartsource.cpp. Definition at line 786 of file llviewerpartsource.cpp. Definition at line 689 of file llviewerpartsource.cpp. References LLViewerPartSource::mIsDead, LLViewerPartSource::mSourceObjectp, LLMemType::MTYPE_PARTICLES, NULL, and TRUE. Definition at line 780 of file llviewerpartsource.cpp. 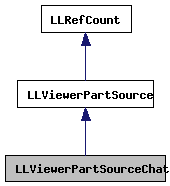 Definition at line 722 of file llviewerpartsource.cpp. References f, F_TWO_PI, LLViewerImageList::getImage(), LLControlGroup::getString(), gImageList, gViewerArt, gWorldPointer, LLPointer< Type >::isNull(), ll_frand(), LLPartData::LL_PART_INTERP_COLOR_MASK, llmax(), llmin(), mColor, LLViewerPartSource::mImagep, LLViewerPartSource::mLastPartTime, LLViewerPartSource::mLastUpdateTime, LLViewerPartSource::mPosAgent, LLViewerPartSource::mSourceObjectp, LLMemType::MTYPE_PARTICLES, setDead(), and updatePart(). Definition at line 697 of file llviewerpartsource.cpp. References F_TWO_PI, LLViewerPart::mLastUpdateTime, LLPartData::mMaxAge, LLPartData::mParameter, LLViewerPart::mPartSourcep, LLViewerPart::mPosAgent, LLMemType::MTYPE_PARTICLES, LLVector3::mV, VX, VY, VZ, x, and y. Definition at line 204 of file llviewerpartsource.h. Referenced by setColor(), and update(). Definition at line 206 of file llviewerpartsource.h.